This underwater image shows a large dent in the lower segment of NASA's Ares I-X rocket after it splashed down in the Atlantic Ocean to end a test flight on Oct. 28, 2009. NASA hasdiscovered a large dent on its brand-new moon rocket after the booster splashedinto the Atlantic Ocean at the end of a test flight this week. 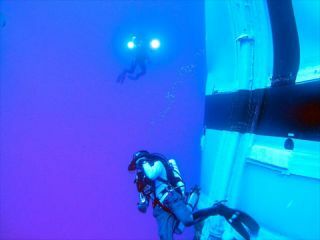 The damageto the new AresI-X rocket, which launched from Florida Wednesday on a short test flight,was spotted by a diving team sent to recover the booster?s first stage. Thefirst stage ? a giant solid rocket booster ? was dented near its base. NASAspokesperson Amber Philman told SPACE.com that the space agency is stillawaiting word on what may have caused the damage. Photos ofthe damage show a giant dent in one of the lower segments of the Ares I-Xrocket?s first stage. The first stage is essentially a four-segment solidrocket booster like those used to launch NASA?s space shuttles, except with adummy fifth segment on top. Ares I-Xlaunched on a $445 million test flight to aid development of NASA?s Ares Irocket, the booster slated to carry astronauts to space after the shuttle fleetis retired. The rocketprototype blasted off from the Kennedy Space Center in Florida on a briefsix-minute flight. About two minutes intothe liftoff, the first stage separated from a dummy second stage made up offake segments. The dummyupper stage crashed into the Atlantic Ocean and sank as planned. The firststage, however, was expected to deploy three massive parachutes and splash intothe ocean much like NASA?s shuttle boosters. One of the giant, 150-foot (46-meter)parachutes reportedly deflated as the first stage fell back to Earth,resulting in a harder-than-expected spashdown, according to a CBS News report. Therecovery team is due to return to the Kennedy Space Center on Friday, NASAofficials said. Spaceshuttle mission managers said the damage to Ares I-X?s first stage poses noconcern for the twin solid rocket boosters on the shuttle Atlantis, which wascleared for a Nov. 16 launch on Thursday. The AresI-X booster is heavier than shuttle boosters and carried other modifications anda different parachute system, NASA?s space operations chief Bill Gerstenmaiertold reporters. Shuttle solid rocket boosters have only two parachutes, headded. ?It?s atotally different system than ours,? Gerstenmaier said. ?There?s been no tie atall between what Ares has got and what we?ve got.? Shuttle officials said Ares I-X engineers will get their first up-close look at thedamaged rocket booster Friday once it arrives in Florida. ?Thebooster comes back in tomorrow,? said shuttle integration manager Mike Moses. ?Sountil that point, everything is probably speculation.? Click here for SPACE.com's full Ares I-Xmission coverage.